If heaven manifests itself differently for each inhabitant I have a good idea of how it would look to a young boy. 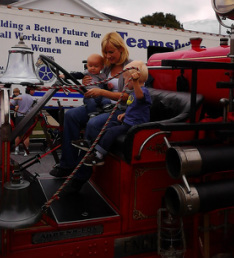 My insight came this past Sunday with a visit to the 15th annual Touch-A-Truck event held in Burlington. Free for all and spread out across the large town center green were at least one hundred trucks in all shapes, sizes, and functions. True to its billing the trucks were open to anyone who wanted to climb on board and dream the dream. I must admit that as a young girl I don’t think I ever have the truck dream or fascination. I played with them for sure, but I don’t recall seeing them everywhere and having to call them out every time I saw one. I don’t remember commenting on the lights or the loud sound (wee-oh-wee-oh) they make as they speed down the street. But apparently it is a genetic 'boy thing' as the participants in the imaginary rides there were easily 95% boy. There were a few girls there (with dads typically) who wanted to take a look, but in general the males ran the day. In case you had a girl with your group who was not interested in trucks, there was a jewelry making table and a few other craft areas where she could be occupied leaving the males free to roam the metal playground that surrounded them. Although not personally ever having had the need or desire to ride a big truck (they are always ‘big’ when spoken about in our home) I have to admit the outing was really fun. You’d be surprised how you can spend two hours looking at and crawling into trucks. My older son who is two and a quarter happily identified the many trucks he saw on this adventure. It’s a “cement mixer daddy” or “a big fire truck mommy” flew out of his mouth multiple times. 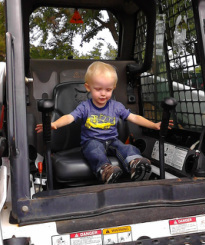 There were diggers, bulldozers, cranes, and back hoes of all sizes. 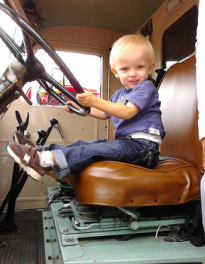 You could climb into the back of a tractor trailer, fire truck, or a police van (the only time when a police van ride is acceptable), grab the wheel of a big rig, or blast the horn of a shuttle van. There was a school bus to explore which I think seems cool only if you have never had to ride in one before. They have got to be the most unglamorous mode of transportation ever invented. My favorites of the day to explore were the antique fire trucks although I much prefer the new versions if my house was actually in fire. To my toddler however they were all winners. So hats off to the town of Burlington and all the other towns and businesses who participated in Truck Day. Thank you for making my little boys dreams come true. See you next year!